﻿ Chandrayaan-2: India's lunar mission to carry NASA's laser instruments to Moon. Chandrayaan-2: India's lunar mission to carry NASA's laser instruments to Moon. Chandrayaan-2, India's lunar mission, will carry NASA-owned laser retroreflector arrays that allow scientists to make precise measurements of the distance to the Moon. The mission is scheduled for launch in April. India's lunar mission Chandrayaan-2, scheduled for launch in April, will carry NASA's laser instruments that allow scientists to make precise measurements of the distance to the Moon, according to the US space agency officials. During the Lunar and Planetary Science Conference held at Texas, US last week, NASA confirmed that Chandrayaan-2 will carry NASA-owned laser retroreflector arrays. Besides India's spacecraft, the science instruments will also be flying to the Moon aboard the Israeli lander Beresheet, due to touch down April 11. Do retroreflectors already exist on the lunar surface? Yes, five such instruments exist on the lunar surface but they have some flaws, according to Simone Dell'Agnello, a physicist at the National Institute for Nuclear Physics National Laboratory at Italy. The retroreflectors flying on Beresheet and Chandrayaan-2 are smaller than the Apollo ones, Dell'Agnello said. 1. 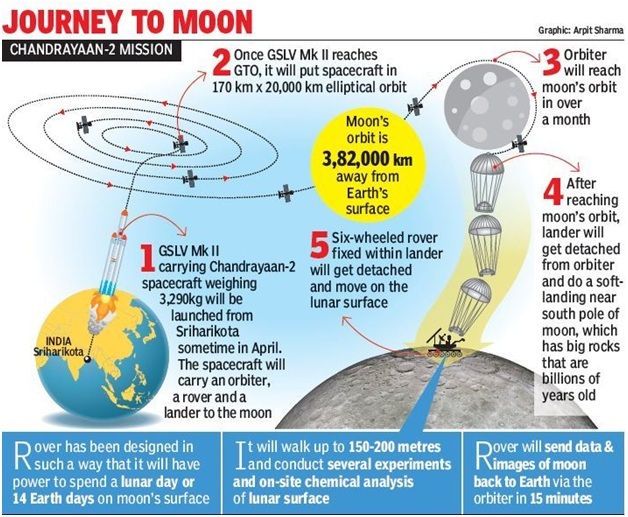 The 3,890-kg Chandrayaan-2 spacecraft, to be launched onboard the Geosynchronous Satellite Launch Vehicle (GSLV) Mk-3, will orbit around the Moon to study its conditions and collect data of its topography, mineralogy, and exosphere. 2. The Rs 800-crore Chandrayaan-2 mission comes a decade after the maiden mission Chandrayaan-1 was launched on October 22, 2008, from India's only spaceport at Sriharikota in Andhra Pradesh. 3. The lander has been named 'Vikram' as a tribute to the pioneer of India's space programme and former ISRO chairman (1963-71) Vikram Sarabhai. 4. When Chandrayaan-2's rover lands on the Moon, India will become the fifth country in the world to achieve the feat after the Soviet Union in 1959, the US in 1969, China in December 2013, and Israel in 2019.